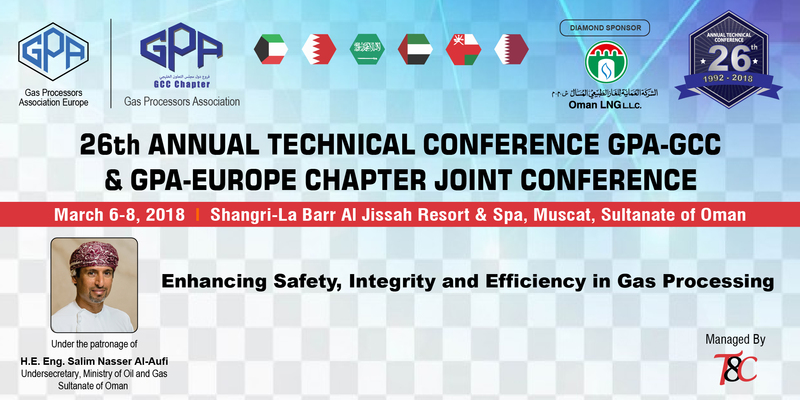 26th Annual Technical Conference GPA-GCC & GPA-Europe Chapter Joint Conference, Exhibition & Workshop 2018 which will be a Joint Conference between the GPA GCC Chapter as well as the GPA Europe Chapter. This event will be held under the patronage of minister of oil and gas H.E. Eng. Salim Nasser Al Aufi in the Sultanate of Oman, Diamond Sponsor with Oman LNG L.L.C. and under the theme of “Enhancing Safety, Integrity and Efficiency in Gas Processing”. of our participants are from the Oil & Gas sector and National Oil Companies from around the GCC who are also members of the GPA GCC Chapter such as Adnoc, Saudi Aramco, KNPC, KOC, Banagas, Bapco, Tatweer, GPIC, QP, Oryx GTL, Oman LNG, Oman GAS, PDO and other Associated Members. To serve as a Forum for the exchange of ideas, technology, and information that will benefit both the upstream and downstream Gas Processing industries, and their Suppliers, with a view toward improving Plant Operations, and Health, Safety and Environmental performance in the GCC countries. To be the focal point and the main source of information on the Gas Processing industry in the Gulf Cooperation Council Countries.